John Kavanaugh, the trainer of MMA superstar Conor McGregor, is reportedly uneasy about McGregor fighting again unless it’s an IMPORTANT fight – a rematch with one of his former top MMA foes, perhaps. Why has the man behind the UFCs biggest superstar gotten hesitant about his fighter’s future? One of the factors is reportedly that McGregor was knocked down by a Khabib Nurmagomedov punch during McGregor’s last fight. As far as Kavanaugh is concerned, the old Conor would never have endured such a shot. It’s easy to take this report as an indication that perhaps McGregor, who is nothing if not game, is simply starting to slip after too many cage wars. Then, however, his 2017 boxing match against Floyd Mayweather comes to mind. Something few talk about is how badly beaten up McGregor was during that fight. Sure, the man had some good rounds, but as the bout wore on, Mayweather laid a beating on the guy, a slow, methodical beating. In the tenth round, Mayweather landed 16-20 clean and unanswered head shots before referee Robert Byrd wisely stepped in and stopped the fight. That’s 16-20 shots, from a professional boxer. Not just a professional boxer, but a professional boxer who most consider to be the best of his generation. 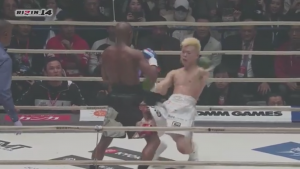 Such things have an impact…just as Mayweather’s one sided thrashing of Japanese MMA star Tenshin Nasukawa today will undoubtedly impact Nasukawa’s psyche and perhaps his future career. Boxing isn’t like other combat sports. It relies on slickness and fluidity in a way others don’t. For this reason, some fans – and even a few participants – of other combat sports tend to write boxing off as a wimpy cousin, something that a “real fighter” doesn’t need to take too seriously. Such thinking is fine outside the ring. Once the participant from another sport engages in an actual boxing match, however, things can literally become dangerous. I’ve little doubt George Foreman could have crushed Muhammad Ali in a parking lot. The two men didn’t fight in a parking lot, however, they fought in a boxing ring – and Ali laid Foreman out. Something to think about. Nasukawa was – and still should be – seen as an incredibly impressive athlete. Watch clips of him that don’t involve Mayweather and it’s hard not to be impressed. He’s a buzzsaw with skill, a guy who can use his hands and feet with frightening speed and precision. It’s easy to see why people thought it was a good idea for him to fight Mayweather. Like McGregor, Nasukawa’s camp probably assumed that Floyd couldn’t really hurt their man. Mayweather’s never been known as a power puncher, after all. What, they probably asked themselves, was the worst that could happen against a 41 year old former ring great? It’s doubtful anyone on Nasukawa’s team thought for a second that Mayweather would demolish their man the way he did today. For the uninitiated, the fight didn’t make it past the first round. Floyd, smiling in a way that was reminiscent of a prime Jack Johnson, simply walked his man down and punched the guy’s lights out, dropping the far smaller Nasukawa a total of three times before the poor kid’s corner wisely stepped in and stopped things. Afterwards, the twenty year old Nasukawa cried, while the 41 year old Mayweather danced. There was reason, after all, for the man to dance. Word is he earned nine million dollars for under three minutes’ work. Some are now saying the fight was fixed. That seems like silliness to me. The only thing that seems fixed is a mindset that says Floyd isn’t a dangerous fighter…and that boxing, at least in relation to other combat sports, isn’t that dangerous of an endeavor. Is This A Real Fight Or Just A Money Grab? For the 5,000th time Floyd Mayweather (50-0, 27 KOs) will once again come out of retirement to step back in to the world of combat. This time however will be a bit different as Floyd will be taking on kickboxing sensation Tenshin Nasukawa in a three round exhibition matchup on New Years Eve in Japan. Are we supposed to believe this is a true fight like Floyd’s 49 victories? Or is it more along the lines of his 50th? You remember the 50th fight of Floyd’s career don’t you? It was against none other than UFC star fighter Conor McGregor. The matchup was built up to be a real fight and the toughest of his career. Fans all around the world soaked it in. After all Floyd was at the time 40 years of age and two years removed from his last professional fight. Conor on the other hand was not only much younger but he was also the significantly bigger man as well. With that being said, those that knew boxing understood that Connor had no chance of winning that bout. Floyd proceeded to do what many knew he would do. Punish Connor. Sure there were a few tough moments for Floyd but he still managed to bully and ultimately stop Connor in the 10th round. There was no doubt as to who would win that matchup. Does his contest against Tenshin Nasukawa fall into the category of more farce than fight? Not quite. So am I saying that this will be more along the lines of Floyd’s first 49 fights of his career? His resume is one of the very best ever. He has defeated a who’s who of all-time great boxers such as Oscar De La Hoya, Shane Mosley, Manny Pacquiao and Miguel Cotto to name a few. Should you place this bout amongst those? No. This contest won’t be in the same stratosphere as those contest were. It seems as though we are right in the middle. To many this is viewed as a money grab and rightfully so. It is after all a three round exhibition match that win, lose or draw won’t count on either mans record. Now I really know what you’re thinking. This is absolutely a money grab right? Listen, with Floyd everything boils down to money. However, his opponent Tenshin Nasukawa is a real fighter. By the age of 18 he had already accumulated a kickboxing record of 99-5. His kickboxing record is 26-0. He has also managed to win many titles along the way. 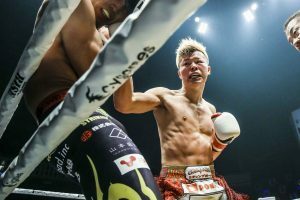 The word phenom is thrown around loosely but that would best describe Tenshin Nasukawa. The details of exactly how much Floyd is expected to pocket from this contest remains a mystery. The money man has stated on numerous occasions over the years that it would take a nine figure payday to get him to fight again so we can assume that he will possibly receive about the same for this bout. So once again is this a money grab? Yes and no? For Floyd “Money” Mayweather it absolutely is. He lives a lavish lifestyle. Owns numerous expensive properties and some of the most exotic cars you can think of. With that being said, that kind of lifestyle is a hard one to keep up with. If Floyd viewed this as something more than just a cash grab then he wouldn’t care if this fight showed up on his record. It is perceived as an easy win, right? The one thing Floyd cares about more than money is that shiny 0 in his loss column. To risk that against a complete unknown is something he will never place a price tag on. Knowing that record won’t be affected regardless of the outcome is a win-win situation for Floyd. This is the biggest contest of his career and he will be looking to put on an absolute show. A win for him (albeit not counting record wise) will change his life forever. Floyd will still walk around with a spotless record but the taste of defeat will still be there. For one man this is just an easy way to make nine figures once again. For the other it is his chance to make history. The fight world was stunned this autumn when Mayweather, via a Japanese press conference, unexpectedly announced he would be fighting Nasukawa. The former pound for pound great abruptly stepped away from the fight just days later, only to come back and say a battle between he and Nasukawa would indeed happen. “From what I know,” said Cruickhsank, “I think there was…a language barrier” between Mayweather and RIZN. Cruickshank also made it obvious he’d still love to fight on a Mayweather-Nasukawa card. At the moment, however, it seems to be business as usual for Mayweather. Recent reports have the man spending over five million dollars during a recent shopping escapade. There’s also a talk of a fight with fellow Conor McGregor conqueror Khabib Nurmagomedov still floating in the air, as well as a potential rematch against arch rival Manny Pacquiao, who will be facing Mayweather protege Adrien Broner early in 2019. “We’re gonna make it happen,” Floyd Mayweather says on a TMZ video clip released on Thursday. He’s referring to a fight with Japanese kickboxing and MMA wunderkind Tenshin Nasukawa. The bout was recently announced to much fanfare by Mayweather, Nasukawa and Rizn Fighting Federation. Then, almost as soon as the news broke, Mayweather appeared to walk it back. “First and foremost,” Mayweather posted on Instagram within days of the announcement, “I want it to be clear that I, Floyd Mayweather, never agreed to an official bout with Tenshin Nasukawa.” It appeared then that matters might be settled, but this recent clip of Mayweather, as he emerges from Peter Marco’s jeweler in Beverely Hills, clearly suggests otherwise. According to Mayweather, the bout will be an exhibition. “It’s going to be the highest paid exhibition ever,” he boasts to TMZ. “Just for promoting this event, so far I made 7 figures.” Mayweather is known to brag about his money, but in the clip, he defends himself against charges that he’s facing financial difficulty. “It’s more like this,” he says. “Bill Gates, Warren Buffet, Oprah, they still go out there and do different things.” As for the belief that the former pound for pound kingpin may be strapped for cash? “I’m far from hurting for money,” he says. “It’s a no-brainer,” Mayweather adds in the clip. “Just because I’m retired from boxing. I still make appearances worldwide and make a ton of money.” Unlike his insanely lucrative novelty bout with Conor McGregor in the summer of 2017, Mayweather makes it clear that this bout will not go on his record. “Small, 9-minute exhibition,” he says. “It’s going to be a little boxing exhibition…no kicking at all.” The fight was originally supposed to go down on December 31st outside of Tokyo. No news has been presented as to when or where the match might now go down. 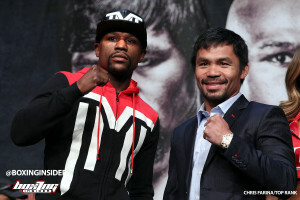 “Once I arrived to the press conference,” he wrote, “my team and I were completely derailed by the new direction this event was going.” Mayweather added that “we should have put a stop to it immediately.” The Vegas based star also added that he wanted to “sincerely apologize to my fans for the very misleading information that was announced during this press conference.” The 50-0 boxer claimed that the abrupt nature of the proceedings had a lot to do with the subsequent miscommunication. The man largely regarded as the greatest boxer of his generation concluded by stating he is “a retired boxer that earns an unprecedented amount of money, globally, for appearances, speaking engagements and occasional small exhibitions.” Boxing Insider will keep readers updated if and when further details arise. The former pound-for-pound boxing king may no longer be regarded as an active boxer, but he remains a fixture in combat sports. Whether rumored to rematch mixed-martial-arts star Conor McGregor, or set to face another undefeated star in the mma world Khabib Nurmagomedov, Floyd Mayweather remains an active headline. What’s the “Mayweather Curse” you ask? It’s simple, much to do about poking fun at coincidental instances revolving around Floyd Mayweather and some of his rivals over the past decade or so. They’ve all engaged in escalated trash-talk and some engaged in battle via the boxing ring. Anderson Silva is no longer really a fixture within the mma world as far as competing, Rousey suffered two consecutive devastating knockouts in the UFC before parlaying a career into the world of fictional wrestling. Financially McGregor is raking in the big bucks and doing exceptional; from a professional fighting stand point his career is in question after losing to Nurmagomedov and Mayweather consecutively. De La Hoya has personal demons on public display in the news unfortunately, along with being linked to inappropriate, racist emails denigrating another person. Pacquiao suffered defeat against Jeff Horn after losing to Mayweather and isn’t a strong fixture within the boxing scene as of now. Some of that is nature running its course as he has a long professional career and is heading towards the finish line. Point being, Mayweather’s rivals have generally been on the wrong end of his wrath. These events could purely be coincidental right? His public persona is that of a man boasting about his finances, women and lifestyle. He’s the Ric Flair of professional fighting. He lived to that moniker for years on end; dominating across five weight classes, spanning across three decades, while collecting large checks and world titles. To reach and maintain that level of greatness, one must be dedicated, hard-working, must be ego-driven and the mental capacity to place everything together. But what comes with that is an addiction to fame, an addiction to the spotlight, the desire for attention and it’s fair to suggest Mayweather is a victim of that. Eventually nature runs its course, nothing lasts forever and empires fall. The Mayweather Curse – as it applies to Mayweather is the curse of wanting more even though time has expired. But that want may end up damaging the foundation of what your success is based off of. Boxing Legend Sugar Ray Leonard has a great quote in an interview with Nathan Rush from Athlon Sports & Life regarding life after boxing, the addiction to fame and difficulty finding purpose once a fighter realizes their career is over. “It’s so seductive. The fame and the fortune — especially if you’re of that marquee level. The fame and fortune is so seductive that you don’t want to let it go. You always believe you have one more fight left in you,” said Leonard. 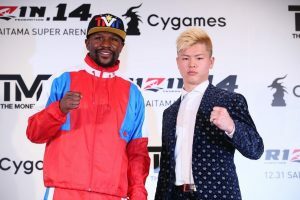 Mayweather shocked the world when he revealed that he had signed with Japanese mixed martial arts promotions company RIZIN Fighting Federation to fight 20-year-old Japanese kick boxer Tenshin Nasukawa on New Year’s Eve in Saitama. The undefeated 41-year-old has never fought professionally in mixed-martial-arts and it has yet to be decided what format and rules the fight would follow. Mayweather’s last bout was in 2017 when he snapped a two-year retirement to pull off a TKO win in ten rounds over UFC superstar Conor McGregor, running his record to 50-0 and most importantly earning close to $300 million for the event he co-promoted. 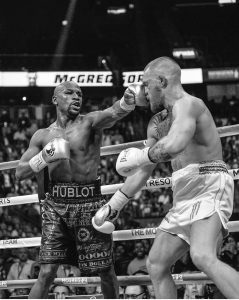 While boxing rules restrict bouts to the use of fists, mma rules incorporate kicks, knees and elbow strikes, as well as wrestling, joint locks and chokes – all unfamiliar with Mayweather. Mayweather is confident they would reach an agreement that would suit both fighters and appears confident with his abilities as an overall fighter. Nasukawa is contracted to RIZIN and competes in their championships in both mma and kickboxing. Mayweather is stepping into another realm and it’s fair to suggest this is just another money grab. Questions remain as to how lucrative can this opportunity be for all parties involved and what are the lasting effects from this move? Will other boxers follow suit and is Mayweather truly biting off more he can chew? “I’ve been blessed to be in the sport a long time and to make over a billion dollars in the sport,” said Mayweather. Mayweather may be tempting fate, facing a fighter half his age with a skill-set he is unaccustomed to facing at the professional level. The chances are he may get humbled in the form of a one-sided beating and or the money generated from this event may not be as significant as initially planned. 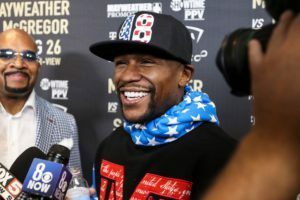 Essentially, the event must manifest before we can analyze the end result, but the desire for additional finances and attention may not lead towards the satisfying outcome Mayweather is seeking. It seems Floyd Mayweather is out of retirement once more. 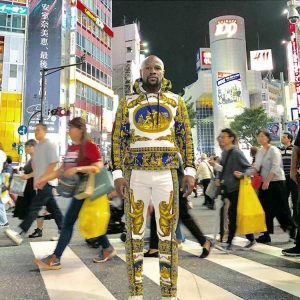 Mayweather (50-0) appeared in Japan last night with Japanese MMA promotion Rizin Fighting Federation. In the press conference it was announced Mayweather would face Tenshin Nasukawa, a 27-0 kickboxer and 4-0 MMA fighter. As yet it’s not known what format the fight will take place, all that was said was it would be under ‘special rules’. Mayweather last competed last year against MMA superstar Conor McGregor, stopping McGregor in the 10th round under boxing rules. Lately Mayweather has suggested he would face UFC lightweight champion Khabib Nurmagomedov however Dana White, the UFC president said this would not happen under boxing rules. The Mayweather v McGregor PPV was one of the biggest PPV events in history. Rizin promoter Nobuyuki Sakakibara gave an explanation on the deal, “I think my shortest answer to that is the fact that now we are aligned to achieve something together and that is hitting a new challenge, taking a step forward to whatever wonderful thing that we can create together,” Sakakibara said via a Japanese translator. Mayweather is looking forward to spending more time in Japan and also the prospect of promoting his fighters there. Nasukawa, is looking forward to facing the undefeated boxer. The event will take place on Rizin’s New Years Eve show a big date in Japanese combat shows, since the days of Pride and K-1. Give this to Floyd Mayweather – the man knows how to keep himself in the spotlight. After it looked like his pay per view numbers might be starting to decline a while back, he finally agreed to meet Manny Pacquiao in what many observers felt was the money grab to end all money grabs. How wrong those observers were. For just over two years later, Mayweather got in the ring with the MMAs biggest star, the one man knee jerk reaction to every anti-bullying campaign known to man, Conor McGregor. Mayweather essentially made easy work of his Irish foe…only to just recently declare he would rematch Pacquiao in the near future. Since then, Mayweather’s focus has apparently switched to Khabib Nomagomedov, the UFC star who recently came close to choking McGregor into oblivion. “Oh, we fighting!” Mayweather recently said of the Russian terror. “He called me out, so he gotta come to my world.” Naturally. One simply can’t expect a world class wrestler to wrestle. There’s simply too much money to be made leaving the cage for the ring and getting punched out by an aging boxing great. Or is there? If Khabib was only kidding when he called out Mayweather (which he did last week) this might all be nonsense. Then again, who knows? At any rate, Mayweather is back in the news today, via TMZ, claiming he’s ready to give McGregor a rematch after fighting Khabib (one has to wonder how many beatings McGregor has left in him at this point). “After me and Khabib lock up,” he’s quoted as saying, “me and McGregor we gonna lock up again.” Mayweather, grandiose as ever, is also quoted as saying: “I’m helping keep combat sports alive!”” Perhaps Mayweather hasn’t heard of the massive 300 million plus deal former foe Canelo Alvarez has made with DAZN streaming service, or of the huge pay per view numbers such fights as Canelo-Golovkin and McGregor-Nurmogomadov have recently done. One suspects, however, that Mayweather has been kept well abreast of such news, hence the splashy headlines he’s taken to dishing out as of late. 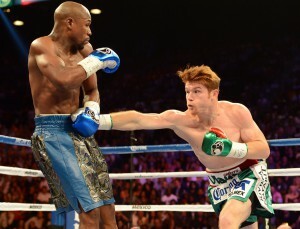 Canelo, boxing’s new king (though many feel he lost his recent bout to Gennady Golovkin, only to be saved by the judges), is patently unimpressed with Mayweather’s latest round of media proclamations. “He wants to continue hurting boxing,” says the Mexican star of Mayweather, “by making fights that don’t make sense … and not giving boxing the credibility it deserves.” A younger, less able version of Canelo lost by decision to Mayweather in a massive 2013 bout. Now the Mexican himself wants a second chance. Less than a month after teasing the possibility of a rematch with Floyd Mayweather Jr., Manny Pacquiao has made the first significant move toward clearing any hurdles. Heavy rumors have swirled about the former eight-division titlist joining forces with Mayweather’s longtime adviser, Al Haymon and his Premier Boxing Champions outfit. Manila Bulletin’s Nick Giongco was the first to break the story on Wednesday, which has since gained considerable momentum despite a single source willing to go on record to verify. It been suggested that Pacquiao’s first fight under the PBC umbrella can come as early as next January. Several PBC representatives have declined comment to BoxingInsider.com on the subject, although also didn’t dismiss such rumors. The development would be the latest in a series of significant boxing power moves within the past few months. As far as stateside boxing content goes, there are three major entities currently controlling the landscape: Haymon’s PBC series, which recently renewed lucrative, long-term pacts with Showtime and Fox/FS1; Eddie Hearn through subscription-based DAZN USA streaming service; and Pacquiao’s former long-time promoter Bob Arum, whose Top Rank outfit is the primary content provider for ESPN and its ESPN+ streaming app. Pacquiao’s contract with Top Rank expired earlier this year. His last fight officially promoted by Top Rank came last July, when he suffered a shocking and highly controversial split decision defeat to Jeff Horn in Australia. The bout ended his third reign as a welterweight titlist, also snapping a two-fight win streak following his loss to Mayweather. The final piece of business between the two came in his July knockout win over Lucas Matthysse in Kuala Lumpur, Malaysia. Top Rank didn’t directly promote the event, but offered live coverage on ESPN+ after Pacquiao’s MP Promotions missed numerous deadlines to distribute through Pay-Per-View. There remained little doubt as to their going separate ways when Pacquiao (or more likely a team member speaking on his behalf) took to social media to demand money owed by Top Rank for U.S. TV rights to the aforementioned event. The issue was quickly resolved, followed by confirmation that Pacquiao would take his career in a different direction. Later that very week, the legendary southpaw from Philippines joined in with Mayweather in trolling the boxing community in suggesting a rematch to their May ’15 blockbuster event was in the works. The declaration came on the morning of the September 15 rematch between Saul ‘Canelo’ Alvarez and Gennady Golovkin, leading many to believe it was simply yet another stunt by Mayweather designed to steal attention from a Golden Boy Promotions event. 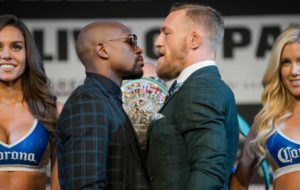 Mayweather came out of retirement last summer to face UFC superstar and boxing debutant Conor McGregor, staging the event three weeks prior to Alvarez-Golovkin I and drawing more than three times as many PPV buys. Once Pacquiao (60-7-2, 39KOs) joined in on the fun—posting “No Excuses #50-1”—skepticism quickly switched to curiosity as to whether it was actually going to happen. Their first fight destroyed all box office numbers within the sport, setting benchmarks that will likely never be surpassed in this lifetime. Even if the rematch doesn’t happen, Pacquiao agreeing to do business with Haymon and PBC opens up a number of future possibilities. Most of the best welterweights in the world—including Errol Spence, Keith Thurman, Shawn Porter and Danny Garcia—all fight under the PBC umbrella. It also opens the door for Pacquiao to secure U.S. TV dates for his MP Promotions stable, which sources in the Philippines claim as an additional motivating factor. Though far from substantiated, a potential first fight for Pacquiao could come versus former four-division titlist Adrien Broner. Where such a fight would land depends on the willingness of PBC’s chief two outlets – Showtime and Fox – ponying up the necessary funds to avoid having to go PPV in back-to-back months, with Deontay Wilder and Tyson Fury locked in for December 1 on Showtime PPV live from Los Angeles, California. A far less expensive route could see him instead take a fight with a PBC second-tier welterweight such as Andre Berto, Devon Alexander, Josesito Lopez or John Molina Jr.
Whatever is Pacquiao’s next move, it will come with an entirely new team in place. The future Hall of Famer—who turns 40 in December—parted ways with trainer Freddie Roach earlier this year, thus ending a 17-year run with the Hollywood-based cornerman. Under Roach’s tutelage, Pacquiao managed to win titles in seven weight classes together (winningthe lineal flyweight champion prior to hooking up with Roach) and enjoyed a mercurial rise to superstardom. His fight with Matthysse came with longtime assistant Buboy Fernandez as his head trainer, who will presumably serve in that role for as long as Pacquiao continues with his career. Along with Roach and Arum no longer along for the ride, BoxingScene.com has reported that Pacquiao has also cut ties with longtime manager Michael Koncz.